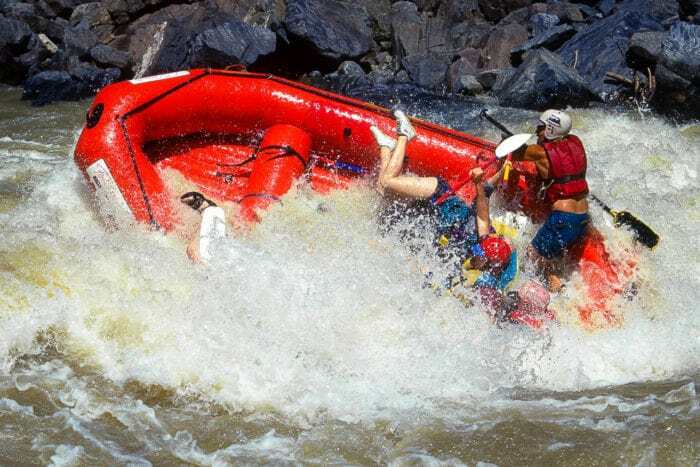 A raft capsizes in 4-Man Hole rapid on the Tugela River, South Africa. 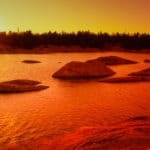 An edited version of this article originally appeared in Outpost Magazine. 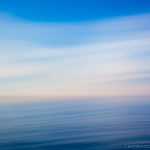 All words and pictures are copyright © Andrew Ross and may not be reproduced or copied in any manner without express written permission. The extended finger of the old African, pointing toward a black mass near the river’s high water mark, meant we’d found what we were looking for. 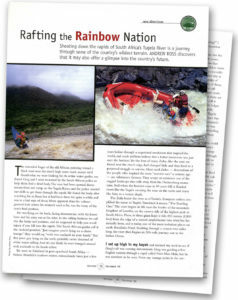 As white water guides, my friend Greg and I were recruited by the South African police to help them find a dead body. 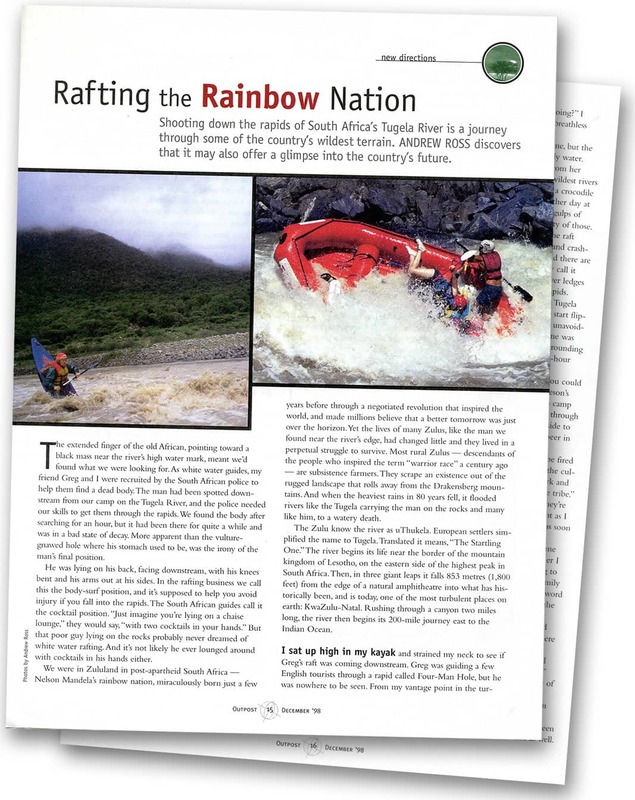 The man had been spotted downstream from our camp on the Tugela River, and the police needed some guides and gear to get them through the rapids. We found the body after searching for an hour, but it had been there for quite awhile and was in a bad state of decay. As a guide, what seemed more apparent to me than the vulture gnawed hole where his stomach used to be, was the irony of the man’s fateful final position. He was lying on his back, facing downstream, with his knees bent and his arms out at his sides. In the rafting business we call this the body-surf position, and it’s supposed to help you avoid injury if you fall into the rapids. The South African guides call it the cocktail position. ”Just imagine you’re lying on a chaise lounge,” they would say, “with two cocktails in your hands.” But that poor guy lying on the rocks probably never dreamed of white water rafting. And it’s not likely he ever lounged around with cocktails in his hands either. 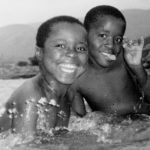 We were in Zululand in post-apartheid South Africa: Nelson Mandela’s Rainbow Nation, miraculously born just a few years before through a negotiated revolution that inspired the world, and made millions believe that a better tomorrow was just over the horizon. Yet the lives of many Zulus, like the man we found near the river’s edge, had changed little and they lived in a perpetual struggle to survive. 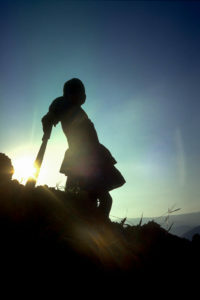 Most rural Zulus – descendants of the people who inspired the term “warrior race” a century ago – are subsistence farmers. They scrape an existence out of the rugged landscape that rolls away from the Drakensberg Mountains, tumbles through the Valley of a Thousand Hills, and falls into the Indian Ocean. I had come to this part of South Africa to work as a guide for six months, and while I was there I saw the long suffering Zulus endure further pain when the heaviest rains in 80 years poured from gun grey skies, flooded their homelands, and carried the unfortunate man on the rocks, and many like him, to a watery death. 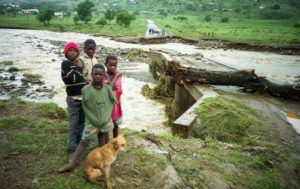 A washed out bridge after the flood. The nightmare began like a noon-day dream as moisture laden clouds seduced the mountains of Zululand in the early afternoon. First they rested gently on the rolling hill tops, then slowly they caressed and eased their way downward into the eroded, red crevasses that led to the rivers below. The rain began quietly, but as night fell the showers came heavy and hard. Water spilled down deforested hills and gouged deep into the earth as it gained speed and destructive force. Forgotten streams were rejuvenated. New ones were born. Together they gathered in the dark and formed huge, collective waves that tore through the valleys of the Zulu. When the flood waters hit the shanty towns near the city of Pietermaritzburg entire families were swept away in their sleep, along with their corrugated tin shacks. In the countryside, men and women succumbed to the raging waters while salvaging crops or rescuing livestock. 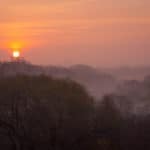 By morning the torrent had subsided, and the sun rose gently on family and friends searching and praying for nearly 200 people who were dead or missing. 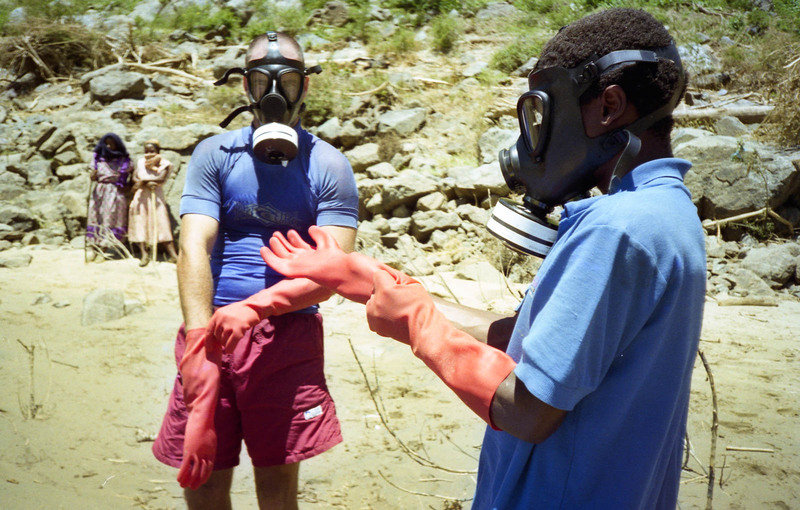 Preparing to recover the body of a flood victim on the shores of the Tugela River. Most of the dead were little more than unsettling statistics spilling from my short wave radio. The rotting man on the river’s edge was the only one I met personally. I wondered about him, about his family. “Will you try and identify him,” I asked the South African cop. He shook his head incredulously. Then he shook out a large, heavyweight garbage bag. I looked on as they brought the man’s knees to his chest and stuffed him into that bag. When I couldn’t look any more I turned and looked at the swirling, silty water in the eddy below me. I stared into the river that killed the anonymous black man being bagged like trash behind me. I stared into the river and its name resounded in my head with shocking clarity. The Tugela begins its life near the border of the mountain kingdom of Lesotho, on the eastern side of the highest peak in South Africa. Then, in three giant leaps it falls 1,800 feet from the edge of a natural amphitheatre into what has historically been, and still is today, one of the most turbulent places on earth: KwaZulu-Natal. Shortly after its spectacular birth in the mountains the Tugela rushes through a canyon two miles long, then begins its 200-mile journey east to the Indian Ocean. 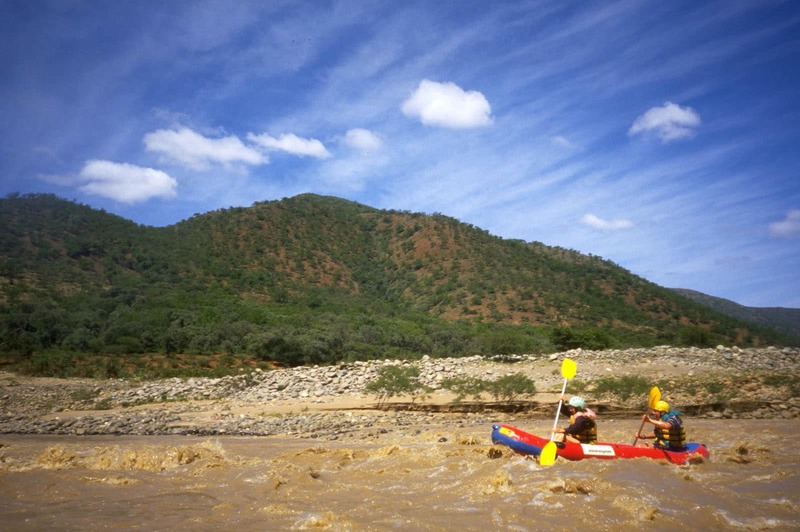 Before it meets the ocean the Tugela is enhanced by dozens of streams and rivers, including the Sundays, the Bushmans, the Buffalo, and the Mooi. It was here, near the banks of the Tugela and its tributaries, that many of South Africa’s deepest cultural and racial wounds were first sliced open, wounds that continue to bleed to this day. A young Zulu girl leans on her panga (machete) near the Tugela River. This is where the Zulu King Shaka violently subdued rival tribes and took power of the region, killing as many as two million people in the process; where the Boers (descendants of Dutch settlers) massacred 3,000 Zulus in the Battle of Blood River; where Zulu killed Zulu in a civil war ending in a blood bath at the mouth of the Tugela, which became known as Mthambo, the place of bones; where the English decimated the Zulus in the Anglo-Zulu war; and where the Boers besieged the British in the Anglo-Boer war. Countless people died in these battles and the blood of many was carried to the sea by the muddy water of the Tugela. South African author and historian Stephen Taylor describes the Tugela as a political fault line and “the Rhine of south-east Africa, a formidable natural frontier, impassable for months after the summer rains.” Of course, it was the river’s formidable nature that brought me and my friend Greg 10,000 miles from Southern Ontario to the southern tip of the dark continent to work as white-water guides. I sat up high in my kayak and strained my neck to see if Greg’s raft was coming downstream. Greg was guiding a few English tourists through a rapid called Four-Man Hole, but he was nowhere to be seen. From my vantage point in the turbulent eddy l saw nothing. Nothing but the chaos of muddy water, rolling, folding, and exploding into huge waves. Then I saw it. A flash of red as the raft crested the top of a wave and quickly vanished again into the next trough. I felt something was wrong, and my fears were confirmed when I saw a swimmer in a faded, red helmet rise to the top of the next wave before the raft. The first swimmer was followed by a few more and finally by the over turned raft with Greg riding it like a giant surf board. They had missed the narrow chute that would let them pass between the huge, liquid, vortex that is Four-Man Hole and the house-size boulder on river right. The raft dropped into the hole instead and capsized in the turbulence. Frantically I paddled into the current, blowing my whistle, screaming and pointing at people to swim to the right-hand shore. Downstream lay sHlabatini rapid and we had only a few moments of relative calm to get people out of the water. If someone was swept downstream they could be carried through several kilometres of continuous, rocky rapids. The swim would be exhausting and a person could easily be overwhelmed and succumb to the river. A raft navigates 4-Man Hole rapid. Greg had managed to right the raft and was struggling to get it to shore with a broken paddle. Most of the crew were trying to swim right except for one, who was swimming left. She was almost to shore, however, so I turned my attention to the ones still struggling with the river. Paddling hard through the waves I pulled one swimmer, then another, out of the dark current as they held tight to the grab loop on the back of my kayak. Greg and the others had made it to shore, so I took a moment in the calm of an eddy to rest. 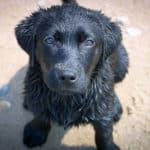 My heart was still pounding when I caught a glimpse of a person in the water. The woman I had seen swimming left was now swimming away from the safety of shore and back into the waves and swirling currents. I plunged my paddle deep into the water and pointed the kayak toward the bobbing helmet. “What are you doing?” I screamed. “You should have stayed near the shore.” Her breathless reply was barely audible over the roar of the river, but it made my spine tingle. “There’s a crocodile!” she said. A crocodile! So the rumours were true. l had never seen one, but the locals told me there were a few lurking in the muddy water. Unfortunately, this pale English tourist, on holiday from her desk, had to get tossed out of a raft into one of the wildest rivers in southern Africa, swim to the safety of shore, meet a crocodile face to face, then swim back into the rapids to prove their existence to me. Just another day at the office… That’s what river guides like to say, usually between gulps of beer, after a crazy day on the water. And we had plenty of those on the Tugela. The action began just metres from our base on the Tugela at the appropriately named Camp Rapid. This was the wake up call. The raft would rush down a rocky chute in the cool morning air and crash into a large wave at the bottom. With any luck, everybody in the raft would get soaked. After Camp Rapid there were 24 kilometres of brown, muddy water (you can’t really call it white water) careening between boulders, dropping over ledges and rushing through gorges to create 18 Class III-V rapids. Rapids like Skull and Roller Coaster (class II-III) got things started. Here we could relax and have fun. 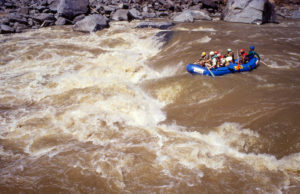 Rapids of this class contain medium sized waves and few obstacles. A good paddler in a canoe could negotiate these rapids without too much trouble. A raft enters Horrible Horrace rapid at high water. 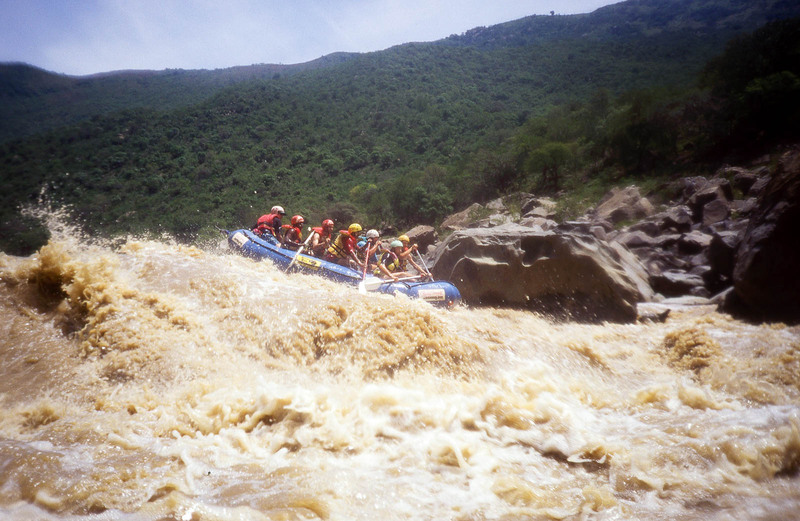 Further downstream was the bigger challenge of the Tugela Gorge. This is where the canoeists get trashed and rafts start flipping. The Class IV-V rapids of the gorge contain huge, unavoidable waves, holes and other assorted obstacles. Precise maneuvers are required by a guide and his crew to make it safely through rapids like these. Even the best guides can flip a raft in this stuff. Sometimes the river gods are smiling on you and sometimes they’re not! The Tugela Gorge is a dangerous place and there is no turning back once you enter it. If someone was injured it was a day’s walk over the surrounding hills to the nearest road, and another five-hour drive to find anything remotely similar to a hospital. If you emerged unscathed from the gorge, however, you could relax again and enjoy the last few Class III rapids at Jameson’s Drift. From here it is a beautiful one-hour drive back to camp through the rolling green hills of Zululand. As we drove through the hills, countless groups of kids would run to the roadside to wave at our pick-up trucks loaded with tired rafters drinking beer in the African sun. Back at camp the bar would be opened and the brai (Afrikaans for barbecue) would be fired up. Huge portions of meat would be consumed and washed down with beer or brandy and coke, usually a triple. Paddlers in a two-person inflatable known locally as a “croc” navigate one of the calmer sections of the Tugela River. It was around the bar and the brai that I gained my deepest insight into the culture of white South Africa. Unfortunately, those glimpses were often dark and revealed the fears and insecurities of the white tribe. “Don’t hang out with the black staff,” said my boss. “They’re all thieves and liars.” “You’ve got to be careful,” said a client as I threw a cold drink to a black man on shore. “They’d just as soon shoot you as look at you.” I heard comments like this almost daily and many that were much worse. Ubuntu. It means “largeness of spirit” and was evident in the lives of the blacks I met, yet was sorely lacking in the lives of many of the whites, save for a select few. These people of different races and tribes where dancing and singing arm-in-arm, sharing and enjoying each others cultures. It is a rare thing to see in South Africa and it made me feel hopeful for at least one night. If it was happening here near the banks of the Tugela, where so much racial strife had been born, maybe, just maybe, it was happening somewhere else as well. 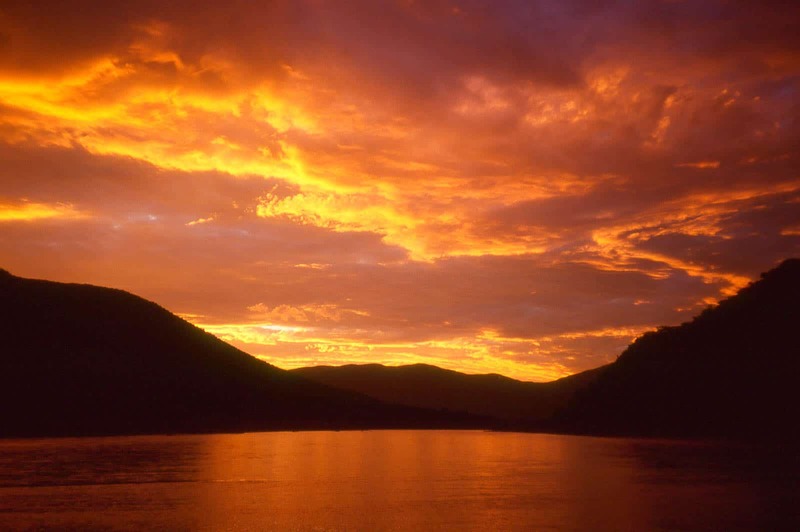 The sun sets on the Tugela River, KwaZulu-Natal, South Africa.